The Primary Years Programme (PYP) was developed by the International Baccalaureate Organisation (IBO) for children aged three to twelve. It has an excellent reputation in the global education community. As an international, transdisciplinary programme, it promotes development of the whole child right from the start. The aim is to encourage all children to acquire academic skills, as well as social, emotional and (inter-)cultural competancy on their own terms. 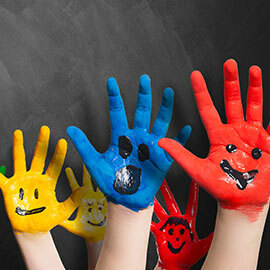 The children's physical and creative/artistic development is fostered by incorporating arts/music and sports activities. The PYP is an ideal combination of the best aspects of the various national education systems und the wealth of experience accumulated by international educational establishments. At our bilingual kindergarten, we thus create the ideal boundary conditions for all children. 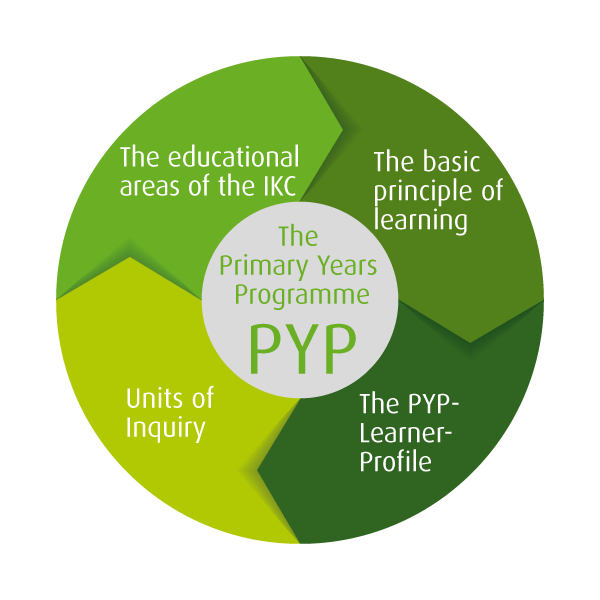 The Primary Years Programme (PYP) of the IBO provides children and teachers with a comprehensive concept regarding the knowledge to be conveyed and the design of the learning phases. It includes a complete curriculum, also covering guidelines on the syllabus content, methodology and assessment criteria. As part of the Units of Inquiry the children expand their knowledge in the areas of languages (English, German), mathematics, science, social studies und ethics. The arts, music, physical education and social learning also form part of the kindergarten curriculum. 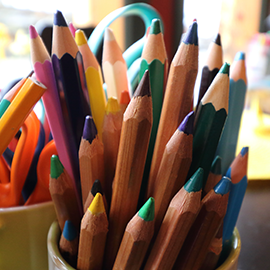 The IKC curriculum is in line with the Bayerischer Bildungs- und Erziehungsplan in all areas and for all ages, providing ideal preparation for the transition to a primary school. At our bilingual kindergarten, we encourage and equip children to get to the bottom of things, to challenge the world, discover new areas and link knowledge. To this end, we use various forms of learning, such as free and project work, which support self-determined learning and a positive development and learning environment approriate to children. At the same time we create space for the children to reflect together, to plan, to integrate new syllabus content, to practise and to consider. In this, our kindergarten focuses not merely on brokering knowledge, but on developing the children into self-confident, curious, independent personalities with a global outlook. What do we know already? What else do we want to know? What is the best way of finding this out? How do we know what we have learnt? In the course of one kindergarten year, the children deal with four to six transdisciplinary "Units of Inquiry" in English and German. Each Unit of Inquiry takes about six to twelve weeks to complete depending on the age of the children and the structure of the unit. 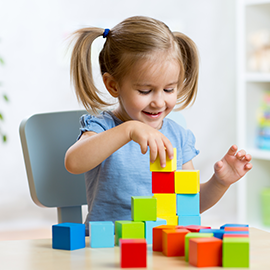 The children learn to consider a topic – the central idea – ask questions about it and research it from a variety of angles and points of view. This is how we encourage the children to discover the world and the fundamental global concepts on which it is based through play in a self-determined way. In our kindergarten we teach linguistic skills, reading and writing, mathematical principles, key scientific laws, aesthetic awareness and a common feeling of social community in a natural way through in-depth exploration of the Units of Inquiry and linking them to a central "big idea". Who am I? What makes me who I am? What is important to me, what do I value? Where do we live? In which age do we live? What ideas, feelings and thoughts do I have? How do we communicate in language and art? What wonders await us in nature and technology? What natural laws are there? How do we interconnect in this world? What rights and responsibilities do we have? How do we act towards humans and other living beings? Multilingualism is a gift to the development and a key skill in a globalized world. Studies show that in their early years, children acquire one or more languages without any problems. Early involvement with foreign languages not only makes it easier to acquire more languages later on, but also stimulates cognitive development overall. And we know that only true bilingualism in the kindergarten – permanent immersion in a language "bath" – leads to children acquiring a new language effortlessly and feeling rapidly at home in the new language. The new language has to be omnipresent – so we pay equal attention and give equal time to both languages, 50:50. We are familiar with the concept from bilingual families - the mother speaks German to the child, whilst the father speaks to him or her in English. At the International Kids Campus all children aer cared for by an English-speaking and a German-speaking professional throughout, following the 'one person – one language' principle. Parents also have the opportunity of choosing a focus language for them. This focus language may be English or German. All children receive additional coaching to improve skills in their chosen focus language. "After just 6 months at the IKC, my son (4) is switching effortlessly between German and English. I am continually amazed - and ashamed that I didn’t believe that my son could do it…"
Children’s development is what motivates us every day, which is why we are always pausing to take stock of development progress and to record it. We consider it particularly important to include children and parents in this process, because development can only be designed and assessed in a shared process. The portfolio is a central documentation tool for one’s own development and learning achievements. Every child collects his or her own “work” in a folder to illustrate the process of his or her development. Our twice-yearly 3-way conferences are a particular highlight. In a 30-minute meeting, children are supported by their teachers as they present their own learning achievements and the documented learning process to their parents. The portfolio and the "work" exhibited in the group room play an important part here. At the end of each semester, all parents receive a report with specific information on their children's academic, artistic, sports and social development. 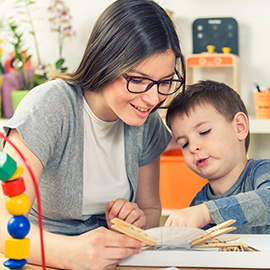 Standardized observation processes are used at regular intervals to allow the socio-emotional and language development of the kindergarten children to be assessed and discussed with parents. Collaboration with parents has a very high priority at the IKC. A trusting partnership of equals is the best prerequisite for healthy childhood development. If parents put their trust in us, their children can also feel safe, happy and looked-after, which is why we are delighted by any opportunity for contact and conversation with parents. We regularly exchange information with parents by having a quick word when they drop off or pick up, by e-mail or on the phone. There is an information evening for all parents at the start of every kindergarten year, during which we provide detailed information about the content of the new year and are available for questions. Twice a year we hold 3-way conferences with children, parents and their carers. This gives parents a good insight into the development and progress made by their child. A portfolio of work on a variety of topics is prepared for every child. Throughout the year, parents are kept up to date about our projects with regular newsletters, enabling them to follow up topics at home. On request, we are always available to parents for further discussions or advice. Parents elect a parent-teacher organization (PTO) every year which functions as a contact point for parents, organizes various activities and is in close contact with the IKC management team and our proprietor. Our quality management process includes an annual parent survey. The IKC is open from 8.00 until 16.30 (or until 18.15 by agreement). From 9.00 until 16.00 we follow a structured day with a variety of activity, rest and learning phases. We always adapt the daily routine on a flexible basis to suit the needs of the children. 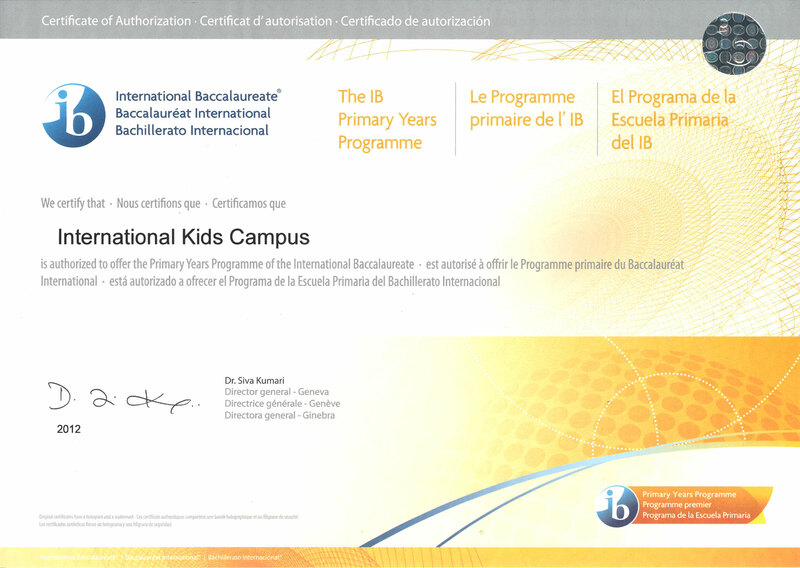 History: the International Kids Campus was founded in 2007 and recognized as an IB World School by the International Baccalaureate Organisation in 2012. The IKC is a limited liability company, with Mr Rainer Eckerl as its Managing Director. Groups: at the International Kids Campus, we look after a total of up to 48 children aged between two-and-a-half and six. The children come from a wide range of different countries of the world. We divide the children into three similar-aged groups (K-Junior – K-Medium – K-Senior). Transfer to primary school: it may be a given in successful schools around the world, but in Germany, it’s often just an idea for the future. Our affiliated international day school enables your children to make a perfectly smooth transition into school. You and your children won’t notice any significant difference between the last day in kindergarten and the first day at primary school – and we say "why should you?"? Meals: children bring snacks from home for short breaks; lunch can be brought from home as well or booked from our catering service, with both vegetarian and meat dishes available. Bus service: on request, you can book a bus service to drop off and pick up your children. The stops for the school bus are available on request. Psychological consulting: the IKC has a psychological consulting service which will advise parents and teaching staff if desired.